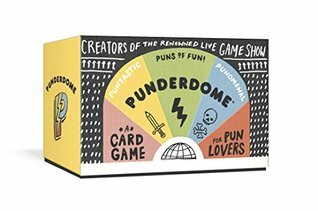 From the daughter-father duo that created Brooklyn's beloved live pun competition comes Punderdome, the "Punderful card game [that] will replace Cards Against Humanity at your next party" (Mashable.com). One part game, one part conversation starter, you don't need to be a pun master to master Punderdome: the goal is to make bad jokes and have fun along the way. A player (the prompter for that round) draws two prompt cards from the deck, and then reads the prompts to the rest of the group, who have 90 seconds to create a single, groan-worthy pun that combines the two prompts. When time is up, pun makers share their puns with the prompter, who awards the prompt cards to the player whose pun he or she likes best. The winner then draws the next pair of prompt cards and the process repeats. Players win by obtaining 10 pairs of cards. When I saw this game, I was super excited. Who doesn't love a good pun? Okay, I know there are people but as someone who has multiple friends who are pun masters, I thought this would be great. Sadly, not so much. If you play by the rules, you're given 90 seconds to take two topics and make a pun out of them. I'm afraid that most of our brains just didn't work that fast. We quickly discovered that it was a lot more fun to toss the rule book to the side and to just see what we could come up with. Final thoughts? If you're a pun master, you may love this game. If you're not, this one is going to be a tough draw. It advertises itself as a replacement for Cards Against Humanity. Sadly, it's just wrong. I will say though that the packaging is lovely...which really feels like me just coming up with something nice to say. I was given a copy of this game for the purpose of this review. All thoughts, comments, and opinions are my own.